What is Avira Antivirus Server? Avira Antivirus Server is a top-performing antivirus for business servers that provides watertight protection with minimal impact on resources. The business security solution is scalable, user-friendly, and easily manageable without incurring additional costs for maintenance purposes. With Avira Antivirus Server, companies can rest assured that their files, as well as those of their customers, are robustly safeguarded against cyber threats in any form that could damage them. Taking care of customers’ security is also an easy process through Avira Antivirus Server’s partner installed and cloud-based management consoles. And to ensure that company servers are safeguarded against the latest threats, Avira Antivirus Server deploys costless virus definition updates silently and automatically. Avira Antivirus Server protects users when they are browsing the web and analyzes incoming and outgoing traffic with a powerful antivirus engine. These features and others ensure that business data, especially customer information, remain safe from more than 30 million threats that could damage servers daily. Avira Antivirus Server is always awake. Because of that, businesses can trust the software to shield their data all the time. Other than that, the application also scrutinizes running processes, on-access files, and system memories for a more robust protection. While Avira Antivirus Server deploys real-time protection for servers, it also enables users to manually activate system scans. In addition, users also have the option to schedule automatic scans so they can rest assured that their systems have not encountered potentially damaging files. Avira Antivirus Server halts cyber threats in their tracks before they could spread across the organization’s network. It ensures that hackers and spies do not get a glimpse of sensitive company and customer data. Although Avira Antivirus Server is a powerful software, it does not tax company resources. That is why it can be counted upon to perform even when they encounter heavy loads. With Avira Antivirus Server, companies do not have to spend more on maintenance. That is because Avira does not interfere obstruct the performances of servers in any way. And in the case that organizations encounter issues, the support team is always on hand to provide assistance. There are well-liked and widely used systems in each software category. But are they automatically the best fit for your enterprise’s specific needs? A market-leading software application may have thousands of users, but does it present what you require? For this reason, do not blindly invest in popular systems. Read at least a few Avira Antivirus Server reviews and consider the aspects that you desire in the software such as the fees, main functionality, available integrations etc. Then, select a few apps that fit your wants. Try out the free trials of these apps, read online reviews, get information from the vendor, and do your investigation thoroughly. This exhaustive research is sure to assist you select the finest software solution for your organization’s specific requirements. 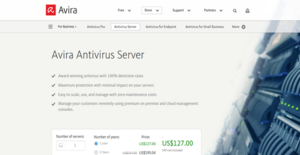 How Much Does Avira Antivirus Server Cost? All subscription plans provide users with unrestricted access to all Avira Antivirus Server features and tools. Enterprise pricing indicated below are based on a single server only. For two or more servers, visit the vendor’s website or contact sales to know more information on the product. We realize that when you make a decision to buy IT Security Software it’s important not only to see how experts evaluate it in their reviews, but also to find out if the real people and companies that buy it are actually satisfied with the product. That’s why we’ve created our behavior-based Customer Satisfaction Algorithm™ that gathers customer reviews, comments and Avira Antivirus Server reviews across a wide range of social media sites. The data is then presented in an easy to digest form showing how many people had positive and negative experience with Avira Antivirus Server. With that information at hand you should be equipped to make an informed buying decision that you won’t regret. What are Avira Antivirus Server pricing details? What integrations are available for Avira Antivirus Server? Avira Antivirus Server partners with the following consoles. For support regarding partner consoles, visit the website to see links leading to channel partners. If you need more information about Avira Antivirus Server or you simply have a question let us know what you need and we’ll forward your request directly to the vendor.